Recreating the classic gag from ‘Knighty Knight Bugs’, the 1958 Academy Award-winning cartoon directed by Friz Freleng, Bugs bids The Black Knight a “farewell to thee”. 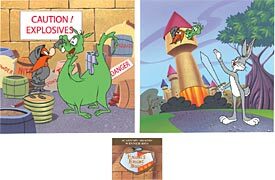 After taking possession of the Singing Sword….and just before the fire-breathing dragon ignites the powder and sends the turret off like a rocket…the sword starts singing “Aloha”. Friz Freleng is the most honored of the Warner Bros. Directors, having earned four Academy Awards during his career with the studio. Under the direction of Avery, Clampett, McKimson, Jones, and Freleng, some of the finest and most memorable Warner Bros. cartoons were created. In 1985, New York’s prestigious Museum of Modern Art hosted a major retrospective of Warner Bros. cartoons. Read more about Freleng.